For months now, I've had an ongoing dialogue with a friend, who has referred to my public side and my private side as the "white librarian" and the "red librarian." I've been amassing fabrics through various sources that I have loved and couldn't imagine parting with; I now have enough to actually make a 'Red Librarian' quilt as well as a 'White Librarian' quilt. 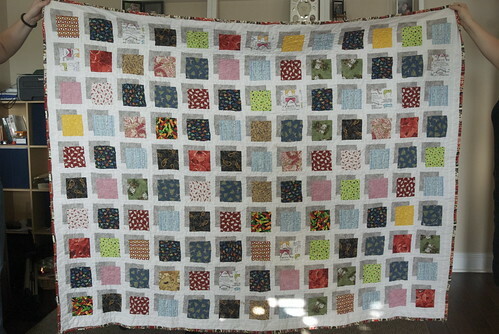 Rest assured that every fabric in this quilt has a story. You may not hear all of them, but they exist. Hat tip: this pattern is the Color Block quilt pattern available on etsy from the user carolinasquirrel.